As you can see, the party was a great success! Many thanks to all the people who donated for gifts. In total, we gave out 62 personalized gifts to children who frequent the library on a regular basis, plus another 20 stuffed animals to kids who attended the party. You should have seen the kids' faces when we opened the enormous toy bag! (Feliz Navidad, I want to wish you a Merry Christmas)! 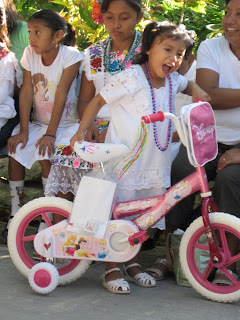 Muchas gracias a la maestra Sandra y las familias en Cancun que donaron para comprar las bicicletas, hicieron muy felices a los ninos! 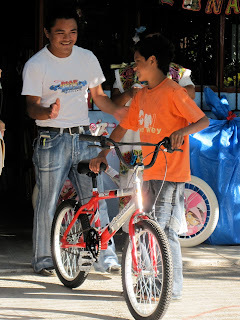 Thanks to our English teacher, Sandra, and the families in Cancun who donated to buy bicycles for the winners, they made these kids very happy!! Felicidades a los niños que con tanto esfuerzo se ganaron estos premios!!!! Congratulations to these kids who gave their best effort to win these prizes!!! !